Must be that new math people keep talking about. I guess that is twitter for you. I think someone just made a mistake when retyping the information because it combined two different tweets. Below is a screen shot of the actual tweets from NWS Dodge City. I find twitter to be a very helpful for keeping up to date on current information on weather and climate change. But, like with anything, it is important to always check the source. Here are pictures from my farm after the blizzard. Incredible. If it was open before, it is still open after the blizzard. Lots of bare road surfaces. But if it was drifted before, oh boy, is it ever drifted. Most of the area behind the outbuildings is 6-8 feet deep, with crests higher than that. That is absolutely bonkers. I wonder how bad the Mississippi flooding could get this spring. The river is already flooding in many locations. A lot is dependent on the spring weather. The western snowpack is quite deep, which will result in significant spring runoff. As I understand it, the eastern river system is already high, so there is the potential for heavy flooding. However, a slow melting spring could alleviate these conditions. We will just have to wait and see, but if I lived there, I would prepare early. 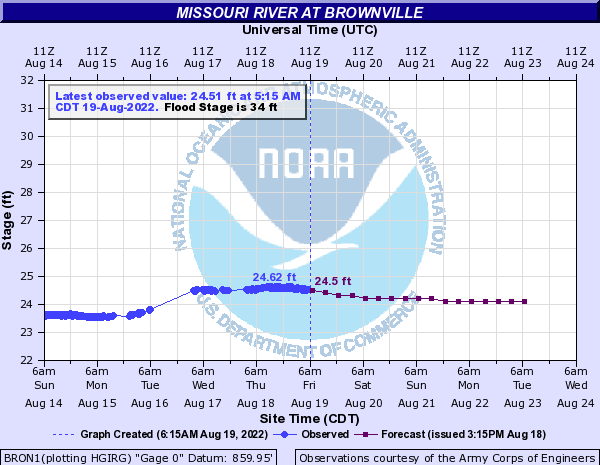 The Missouri is a few inches away from the Brownsville nuclear plant's emergency status level and is forecast to breach it by almost 2 feet in the coming days. River level records have been smashed in four states in the Plains and Midwest, and river flooding will continue for several more days after rapid snowmelt and heavy rain from the bomb cyclone swamped the nation's heartland. As of Friday, 24 locations have topped new record river levels, mainly in the Missouri Valley from southeastern South Dakota into Nebraska and western Iowa, but also in parts of Wisconsin and Minnesota. While smaller creeks, streams and rivers have crested or soon will, larger main stem rivers might continue to rise and remain in flood for days from the central Plains to the Mississippi Valley, Ohio Valley and Great Lakes as this volume of water slowly moves downstream. There were over 300 river gauges above flood stage in the Mississippi River and Missouri River watersheds. The good news is mainly dry weather is expected in the nation's heartland for the next several days. However, markedly warmer weather is also expected, which will accelerate melting of lingering snow cover from the northern Plains into the northern Great Lakes. As a result, water from melting snow will continue to pour into smaller tributaries, then larger mainstem rivers, likely keeping those mainstem rivers relatively high over the next few weeks. Nebraska's sixth largest city has become "an island" amid historic flooding in parts of the Midwest that has left one man dead, forced a National Weather Service office to evacuate and may force a nuclear power plant to shut down out of caution. On Saturday, a levee was breached northwest of the city, prompting law enforcement officers to warn people to get to higher ground. ... Wight told weather.com there is "concern" for the nuclear plant but that it "is perfectly safe." 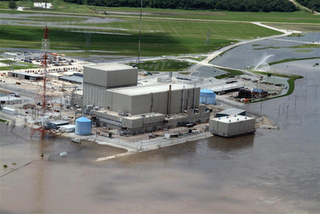 ... Mark Becker, spokesman for the Nebraska Public Power District, previously told the Omaha World-Herald that if the river rises to 45.5 feet this weekend, as projected by the NWS, the nuclear power plant, which accounts for 35 percent of NPPD's power, will have to be shut down. The water surpassed that level early Saturday and reached an all-time record 45.64 inches. Some incredible record breaking temperatures going on here. Temperatures surged above 70 degrees in Alaska and northern Canada this week. All-time March records were shattered in these northern latitudes. Seattle nearly hit 80 degrees, their warmest day anytime from November through March. Farther south, Tofino, British Columbia, also crushed a March record Tuesday, soaring to 24.5 degrees Celsius (about 76 degrees Fahrenheit)... It appeared this would have also set an April all-time high, there. However, a freighter - Hagland Captain - also lost engine power and two helicopters were diverted to rescue its crew. 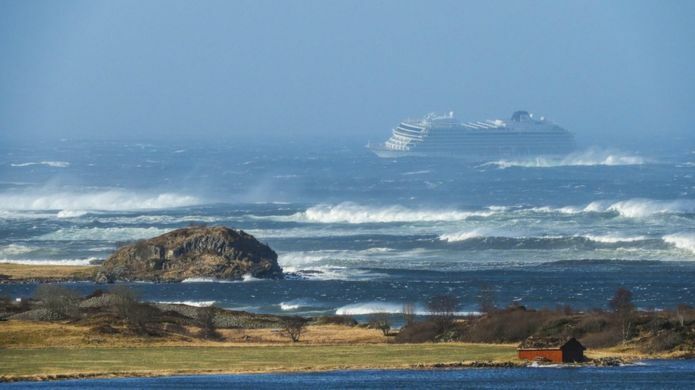 Waves are reported to be more than 10 metres high, with one local newspaper reporting lifeboats were forced to turn back en route to the ship due to the "brutal" conditions. There was no warning. One moment passengers were sitting at a piano bar on their huge cruise ship slipping through the water off the East Coast and seconds later the ship started tilting. ... And tilting. ... And tilting. Hurricane force winds + Maximum wave height of 60-80 feet. Image below. More maps at the link. one unnecessary boat full of bling .. 5 helicopters to the rescue .. 1 country drowning .. 4 helicopters . Priorities please .. b.c. Spring has arrived in Alaska, and it’s early, meteorologists say. For the first time in 102 days, meteorologists on Saturday measured less than one inch of snow at Ted Stevens Anchorage International Airport, the National Weather Service Anchorage forecasting office said in a tweet. That means that, unless more snow falls — and forecasters don’t expect it to — spring melt is here. That makes this year’s melt the fourth earliest on record, just behind 2016, when the melt started on March 22; 1980, when it started on March 24; and 1987, when it started on March 26, said Rebecca Anderson, a meteorologist with the NWS. On average, that less-than-one-inch mark isn’t typically reached until April 17. This year’s early spring comes amid weeks of record-breaking high temperatures, which have peaked in the high 40s and 50s. That’s nearly 20 degrees above the average March maximum temperature normal of 33.9 degrees, according to climate data. Anchorage broke or tied temperature records seven days in March, all of which were in final two weeks of the month, Anderson said. Saturday’s high of 50 degrees tied a record set in 2016. Other places around Alaska have also seen unusual warmth. The NWS Juneau office reported Saturday that its forecasting area had seen 14 consecutive days of record-breaking or record-tying temperatures. The most recent were in Skagway, where temperatures peaked Saturday at 58 degrees. In Fairbanks, the low on both Monday and Tuesday was 34 degrees. The city’s lowest temperature has only been above 34 in March on one other day in the last 114 years, the Fairbanks forecasting office said. Fairbanks had low temperatures of 34°F on both Monday and Tuesday of this week. In the entire temperature record for Fairbanks, a low temperature warmer than 34°F has occurred only once during the month of March. 31°F is the normal high for 3/27. "Huge spring storm likely to unleash blizzard, high winds and flooding in the Central U.S. midweek"
Like the March “bomb cyclone,” it might set records. For the second time this spring, a powerful, probably historic storm is set to rapidly strengthen in the Plains this week. Like its predecessor, the March “bomb cyclone,” it is expected to generate blizzard conditions in some areas and heavy rain, thunderstorms and flooding in others, along with a sprawling area of high winds. Despite the calendar drifting deeper into April, the biggest story from this storm sequel might be the predicted heavy and wind-blasted snow from South Dakota to southern Minnesota and Wisconsin. But that’s just part of the story. To the south of the snow in the Great Plains, the potent winds may also whip up fires. Severe thunderstorms are also likely near the storm center in Kansas and Nebraska, as is additional flooding into the upper Midwest affecting the Missouri and Mississippi river basins. The storm rapidly takes shape Tuesday night as a frigid river of air 30,000 feet off the ground moves through the Rockies. Into Wednesday, it spills out over the open Plains, uncorking the cap on a volatile situation. Maybe they are exaggerating with the title. Most likely. Everything in the media seems to be "historic" these days. They respond as if this never happened before. This region is well known for these types of storms - even into May. Everything in the media seems to be "historic" these days. They respond as if this never happened before. This region is well known for these types of storms - even into May. I know you read this forum, Kat. I know you do read that there are record-breaking climate news all around the world. You do know that due to climate change storms are getting stronger. So, may i ask what you mean exactly? Is there a special reason why you doubt the article? I am not doubting the article. However, I am questioning your statement that climate change storms are getting stronger. Most data seems to contradict that. "Imagine the most intense thunderstorm you typically experience in a single season. Our study finds that, in the future, parts of the U.S. could expect to experience five of those storms in a season, each with an intensity as strong or stronger than current storms,” said NCAR’s Andreas Prein, who led the study team. The number of very intense storms, on the other hand, will increase, and along with it, the risk for insurers. However, I am questioning your statement that climate change storms are getting stronger. Most data seems to contradict that. I am questioning your claim. Show me what contradicts those experts, please. good data (1985 – 2017) have been flat to downward, but this time period is not sufficiently long for a credible conclusion. This result is consistent with previous research by others"
This paper concludes that they can't make an assumption on this historical data. ...this time period is not sufficiently long for a credible conclusion. At yet you present evidence based on assumptions, projections, and extrapolations? Yes, one can make assumptions in physics. This is why GPS works. If you know that one variable in your equation changes, you know the outcome will change. If you know temperatures are rising, other things in your climate system must change as well. Of course! But if the current changes in the data, which are supported by the variables in the equation, are not statistically significant yet, you seemed to regard as not credible. Yet, you regard future changes, based on the same equations, to be credible. Then to quote Archimid, you chose to cherry pick tropical cyclone activity over one area of the globe, which dismissing changes elsewhere, and crying uncertainty over that data which you dislike. No, i randomly picked in the forum search. I took the most recent ones. However, i'm not an expert on the topic. What's shaping my opinion on the topic is Munich Re. They have the best risk assessment money can buy, and they expect storms will cause more damage due to climate change. I understand that they will expect more damage. However, that damage is a result of more people building in higher risk areas, and not greater storm severity. In the past, people did not build in flood plains, hurricane zones, and other areas of higher weather-related risks. Looking more closely at Munich Re (which I agree is valid), they contend that the risk is largely due to increased flooding. I will agree that climate change is likely to increase precipitation, and consequently flood potential. However, increased precipitation does not correlate with storm severity. While the severity of storms is expected to continue its declining trend, rainfall associated with these storms is expected to continue on its upward trajectory. The same can be said for snowfall amounts, which depend largely on the availability of moisture. We may be talking past each of with regards to storm severity. I consider other factors, winds, lightning, hail, tornadoes, etc., to be aspects of severity, while enhanced rainfall is not. Last year, Hurricane Florence made landfall as a category 1 hurricane, with winds of 90 mph. Conversely, Hurricane Michael made landfall as a cat. 4 storm, with winds of 155 mph. While Michael caused an estimated $8 billion in damage, Florence has been estimated at $22 billion, primarily due to the flooding caused by the rain. This is where data from Munich Re may be valid for insurance purposes, but does not necessarily correlate with storm severity. storm severity does not exclude rainfall as a measure .. and why clutter up an informative thread with arguements about size .. there are other places for such ... b.c. Looking more closely at Munich Re (which I agree is valid), they contend that the risk is largely due to increased flooding. No, sorry, that's not what they are saying. Increased flooding, heatwaves, droughts and severe storms: for over 40 years, Munich Re has been researching changes in the frequency and intensity of weather-related loss events and has made use of this knowledge to better assess weather and climate risks and to develop commensurate solutions for them. I will agree that climate change is likely to increase precipitation, and consequently flood potential. Well, call me naive, but in my understanding, a storm that has higher precipitation is more severe. We may be talking past each of with regards to storm severity. Actually, no. A long, persistent rain event can dump an inch or two of rain, without producing lightning, hail, tornadoes, or even high winds. Conversely, and intense thunderstorm may incorporate all these, but drop less than half an inch of rain. Granted, than rain may fall in 30 minutes during the more severe storms. I will agree that climate change is likely to increase precipitation, and consequently flood potential. However, increased precipitation does not correlate with storm severity. While the severity of storms is expected to continue its declining trend, rainfall associated with these storms is expected to continue on its upward trajectory. Why are you like this? I know that you are aware that you are just making baseless, circuitous arguments with the sole purpose of disrupting threads. This is a thread about ‘weird weather and anecdotal stories about climate change’ - not an avenue to explore why your personal feelings on the severity of storms are more valid than those of researchers and risk assessors who study this topic daily. Stop mucking things up or go find a different forum to troll. Some issues are more important than your perverse need for entertainment. Sorry, I thought was an information thread. I will you to your gossip in the latest weather, and stick to the scientific ones. At least nine people have been killed by flash floods in Rio de Janeiro. The mayor has declared a crisis after the Brazilian city was battered by heavy rain on Monday and Tuesday. More than 31cm of rain (13 inches) fell in some parts of the city within 24 hours, the mayor's office said. In de afgelopen 24 uur is in Rio de Janeiro 106 millimeter neerslag gevallen, meldt Weeronline. De dag ervoor viel al 50 millimeter. Normaal valt in heel april zo'n 70 millimeter neerslag. In the 24 past hours 106mm of rain has fallen. The day before it was 50mm while the normal april avarage is 70mm. When having an argument it is as well to define the terms of engagement? e.g. define severe weather. Not easy. The USA National Weather Service has a website page entitled Severe Weather Definitions https://www.weather.gov/bgm/severedefinitions which lists severe weather types but only two definitions. A thunderstorm that produces a tornado, winds of at least 58 mph (50 knots or ~93 km/h), and/or hail at least 1" in diameter. A flood which is caused by heavy or excessive rainfall in a short period of time, generally less than 6 hours. Interesting that this website page does not refer to long lived slow moving high rainfall events (SW USA two(?) years ago?) or Hurricanes. Now it is established that a single agreed definition of severe weather is probably impossible, the entire argument about increased frequency and severity of the aforesaid events becomes pointless. For me, I feel that weird weather (very severe) is when the measure of the weather is historically unprecedented or highly unusual. The three 500 year floods in Houston over a period of five years as an example and the 50" of rainfall from Hurricane Harvey in Houston 2 years ago. Record breaking heat or cold, record breaking rains and winds, etc. For me it's the anecdotal stories. I think I am probably one of the least ( formally )educated people on this forum but I have, like any other human, stories to tell. Watching as the ocean has changed over my lifetime as a commercial diver and fisherman gives me an opportunity to tell a unique story. I have watched as the abalone resources have , for the most part , collapsed. The starfish and the sea urchins also succumbing to disease brought on by the stress of increased ocean heat. My own guilt in knowing that the fuel I have used to pursue a fishing career has contributed to the death and mayhem now all around me. My transition to farming also comes with stories of decline. The 108 F heatwave that last year killed all the fledgling swallows in their nests and this years abandoned nesting colony that had returned every one of the last twenty years till now. The disappearance of the Phoebes that also shared my farm with me for twenty years, the noticeable declines in insects. The loss of so many pines and oaks during our eight year drought. The struggles against what appear to be irreversible changes. Tragic losses and what passes for my feeble attempts to forestall future horrors yet unseen. My stories, our stories , and the emotional context that might inspire others to look a little deeper , fight a little harder, and on occasion shed tears over our shared losses. Well written...I've gardened all of my life and have seen so many things change over the past 50 years due to changes in the seasons. My backyard use to be filled with birds 30 years ago. The chirping in the bushes was riotous. No more. No doubt well written. However, when I ask my parents to tell me about the climate of their childhood, or ask my friends about the climate 20 years ago, their memory is absolutely far, far from the reality of hard data. They remember things that never happened, and remember things differently the way they actually happened. Never trust anecdotal evidence and never even trust your own memories. Hard data is the only thing that matter, because your memories will fool you. When I ask pepople in my country, 99 out of 100 says that in the past there was much more rain (actually rain is UP 10-20% in the past 30 yrs), winters were snowier (they were not), there are more extreme rain events (nope), etc. El Cid sounds like your personal anecdotal story to me. Well, when they were children, the snow came up much higher on their shorter bodies. This thread is in part anecdotal stories, that and weird weather. My stories came with forty years spent as a modern hunter gatherer. I either made good choices or I went broke but the full span of it left me with some good stories as a consolation prize . I happen to believe stories have value as do long term biological datasets. But the data set without the story that follows it will often fall on deaf ears. A story is designed to transport the listener into another mans experiences. If a good story and a good long term dataset can be turned into a convincing message then the final product is likely more convincing than the data or the story standing alone. If a good story and a good long term dataset can be turned into a convincing message then the final product is likely more convincing than the data or the story standing alone. Now that - I can fully agree with! Another "bomb cyclone" hits the U.S. Midwest. Parts of Minnesota saw more than a foot of snow through early evening Thursday — with more snow on the way for much of the state as a strong, complex storm continued to move across the region. A weather spotter in Ortonville in far western Minnesota reported 14 inches of snow. Dawson, Minn., reported 11 inches. The Minnesota State Patrol reported over 300 car accidents on Wednesday and Thursday, including 40 with injuries. The total included 46 jackknifed semitrailer trucks. "Troopers are responding to more jackknifed semis than I can remember," according to a tweet from the state patrol. Well said here and other parts in this thread. I too am looking into transitioning into farming. I feel like I need to provide more directly than the specialized job I have as a career for the moment. Thursday’s blizzard was the second “bomb cyclone” storm system to hit the region in a month. It closed highways, knocked out power to tens of thousands of people and left behind 25 inches of snow (63.5 centimetres) in northeast South Dakota. This one hit me dead on. Everything had just melted out and the ground was starting to dry out. The grass was trying to green up. It was 70 on Monday. We got 25" at the farm. With lots of wind, lots of giant drifts. 4-6 feet high drifts out and about, some drifts all the way up the east side of buildings so you can walk to the roof. Horrible timing, everyone is calving. I spent the blizzard at a neighbor's place helping them with their cattle. We didn't lose any but we've heard several neighbors lost a lot. Second major blizzard in less than a month. At least this time the ground is thawed and the sun is a lot higher in the sky. It's melting already, from the bottom and the top.